Tarts I would repurchase from the last basket include: RG Cinnamon Glazed Oranges bright and perky oranges paired with spicy hot cinnamon, RG Cinnamon Pinecones, SMT Icecream Scoop Bread/Honey Gingerbread kicking myself for not ordering this recently, CFTKR Dance of the Sugar Plum Fairies, CFTKR Santa Claw, CFTKR Spiced Orange, CFTKR Sugared Strawberry Spruce. Pine forest home here I come! If you would like to know about anything in particular more in depth just let me know! 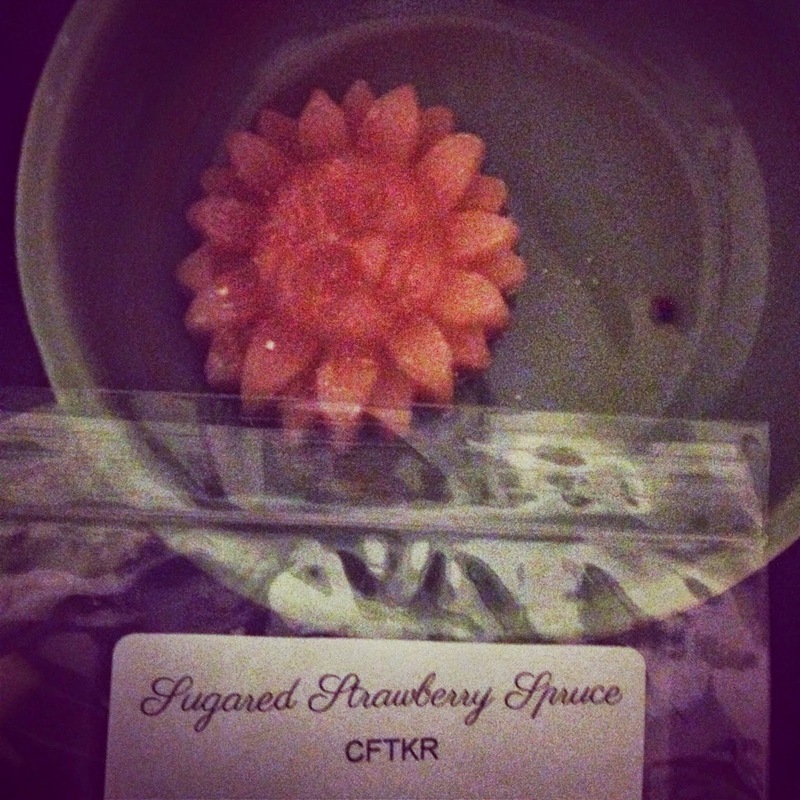 Sugared Strawberry Spruce from Candles From the Keeping Room really wowed me. I was skeptical of how strawberry and spruce would meld but I should have known better than to doubt Carol's mad magic skills with her superb strawberry. The fresh realistic strawberry and out of doors evergreen paints a picture of a wild strawberry patch, the berries glowing like small red rubies, thriving in a clearing cradled by spruce trees sparkling with snow. Once I discovered the beauty of this ol' gal the bittersweet realization that it was my only one came upon me. But better to have smelt than to never have smelt at all. Right? Please say yes. Oh! Yes, this one threw strong and about 4-5 hours. Loved it. Repurchase. 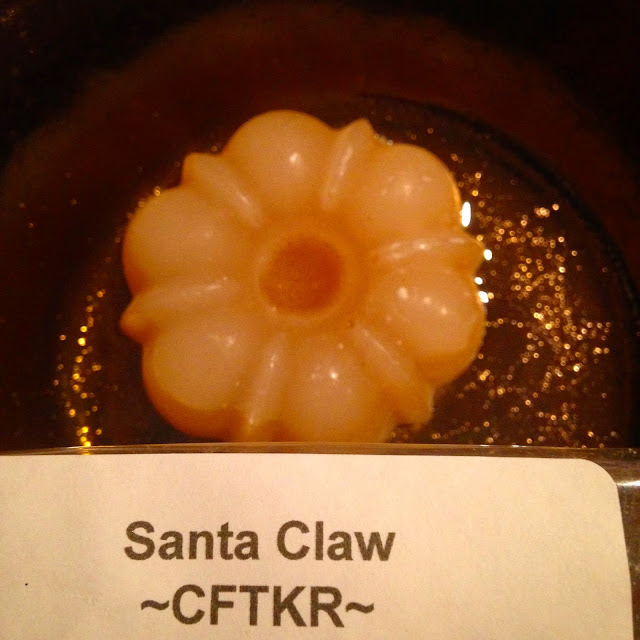 Santa Claw from Candles From the Keeping Room is a tart sweet and delectable enough to even make Oogie Boogie sit up and be nice to old Sandy Claws. It reminded me of flaky pastries drizzled with honey and frosting. Actually, after reading Scorpio Races, I bet this is what November cakes smell like. Yum. There was little to no spice detected. Repurchase. I fell in love with this book initial at Books-A-Million and knew it had to sit on my fabric cabinet next to my much loved book page wreath. Have you found any unexpected treasures while browsing the stores for gifts recently? I love the wreath, photos and book initial on top of your fabric cabinet! It looks great! Thanks! I have been into bookish decorations lately. You're telling me! I will be rationing my bag of FPS for a long time. I still can't get over how great it married with spruce. Truly amazing. OMG, that book page wreath, did you make it yourself? It's absolutely gorgeous, I have never see anything quite like it! Isn't it awesome?! My friend Tricia made it for me! Here is her post with directions, she says it is pretty easy! I need to know about your book page wreath also!! Thank you so VERY much for making Strawberry Spruce happen Lynda. My nose will have treasured that for a long time to come. Aww so glad you still love your wreath!! Love your "J"! Very cool! Making the wreath isn't hard (as long as supplies are cooperating, LOL) but it is time consuming -- takes a lot of patience! Yep! Christmas all up in this basket!